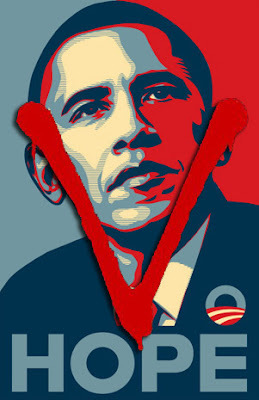 Been watching the original "V" on Syfy and I couldn't help but notice some of the similarities between it and the Obama administration. They came with promises of hope and a better life but some saw a hidden ulterior motive. They end up bringing in someone to help spread their propaganda (NEA & MSNBC), they go after the media when they try to expose the truth (FNC), in the show it's our leaders who give control of the media to them where as here they've just rolled over and surrendered themselves, we start to give more and more control to them, people start to be afraid to criticize them and they take advantage of a "crisis". I wonder if ABC will change these things in their updated version? Okay, so that's a little creepy!